After 52 years of pitched conflict that claimed the lives of some 220,000 people (the majority civilians), displaced 7 million more, and saw families torn apart by thousands of kidnappings, Colombia’s historic transition to peace has stumbled, but remains on course. 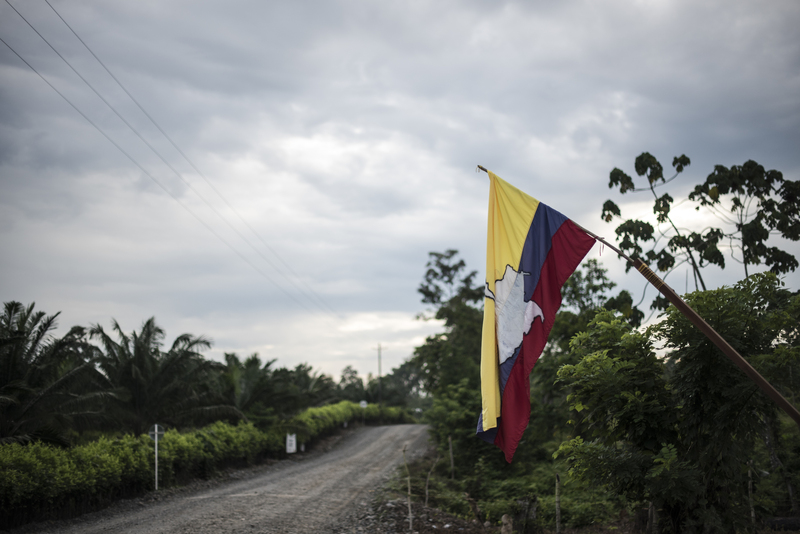 As the peace deal is slowly implemented, around 6,300 former FARC guerrilla soldiers wait in 26 zonas veredales — transitional camps — across the country. On May 31, in accordance with the peace deal, the guerrillas will have handed over all their weapons to a UN Peacekeeping mission, who will melt the weapons down and use the metal to build peace monuments in Bogotá, Havana and New York City. By that point, former combatants will either have been granted amnesty and transition into civilian life or face charges of war crimes under a new law passed by the legislature. VICE News spent a weekend inside one of the camps, normally closed to civilians, to document some of the final days of the FARC. Zona Veredal ‘La Variante’ lies 30 miles from Colombia’s Pacific Coast city, Tumaco. Along the banks of the Río Mira, 10 miles from the Ecuadorian border, this demobilization camp lies in the heart of the Nariño region and Colombia’s infamous, illicit coca trade. Farmers here grow coca in large plantations hidden by a dense wall of trees, or on steep slopes that descend into the river. The flag of the former Fuerzas Armadas Revolucionarias de Colombia, or FARC, as seen above, still flies in many of the communities here. Colombia’s peace deal with the FARC created 26 temporary demobilization camps across the country. Closed to civilians, and swelling by the day with newly surrendered troops, the camps are home to the guerrillas for the foreseeable future. UN representatives stop by most days to provide lectures to FARC members and offer advice on life after May 31. La Variante is home to more than 300 former FARC soldiers. Some had served decades with the FARC, others had joined just 12 months before the peace deal was announced. Men, women and increasingly children wait in an uneasy boredom for their transition into civilian life. Some still wear their uniforms. Most — for now — still carry their guns. Portraits and photographs of former and existing FARC leaders line the walls of the camp. These images were commissioned by the self-proclaimed Office of Propaganda that is attempting to transition the FARC’s message from staunch internalized communist rhetoric to an external message palatable for the group’s new political party. Pedro Antonio Marín, better known by his nom de guerre Manuel Marulanda, second from the right, founded the FARC in 1964 to champion the rights of rural Colombians. He evaded arrest throughout his lifetime, hiding in camps throughout Colombia. He died in 2008, believed to be age 76. Many former FARC leaders and commanders continue to be celebrated by the group’s soldiers long after their deaths, shaping the collective memory of the organization. Members of the FARC watch the Hungary v Portugal World Cup qualifying match in their central dining hall on Saturday March 25, 2017. Camps have satellite TV and dirt floors. FARC members play volleyball in the entrance of the camp. After years — for many, decades — of pitched conflict, the realities of peace sit with an uneasy boredom, as soldiers wait out this transitional phase into civilian life. Dejación de Armas — the laying down of arms — forms part of the agreement on the bilateral and definitive ceasefire and cessation of hostilities, and provides for the handing over of FARC weapons to the United Nations. The UN will then proceed to use this weaponry to construct monuments to peace in Colombia, Havana and New York City. More than 300 soldiers live within La Variante, and the FARC — adept at construction and building camps in inhospitable locations — have created order and infrastructure within the zone. From working showers, to tapped electricity cables, to livestock and libraries. Daily life is defined by scheduled shifts, classes and perimeter patrols, as the FARC frente attempt to retain some internal control in a process being determined far beyond their gates. After 52 years of guerrilla warfare, peace has fueled a baby boom. Female FARC fighters, previously obliged to use birth control (and in some instances, illegal or forced abortions) are building families. Marlon Palacios, 23, the new father of three-month-old Brianna Mishell Tosao Muñoz, plays with his daughter in their makeshift lodgings. Johny Mesa, 24, completes his construction shift in the camp. The zonas veredales were presumed to be temporary shelters for the transitioning FARC members to be destroyed by May 31, but after delays in construction and the slow rollout of an amnesty law, FARC commanders are asking for extensions of six months to a year. With materials donated by the United Nations, sleeping quarters, storage units and communal halls are being constructed quickly as more and more soldiers arrive at the gates. Arenas Arbey, 40, joined the FARC 10 years ago. While many of his peers now wear civilian clothing, Arbey still sports his uniform. For the 6,300 demobilizing FARC soldiers what peace will bring them — economic opportunity and stability or frustration and alienation — remains to be seen.